Gordon White is now a major influence within chaos magick. I recently finished reading his latest book, The Chaos Protocols: Magical Technicques for Navigating the New Economic Reality. I have no problems with the ritual. However, White suggests that, consequent to its performance, “family-owned houses have sold for over a million dollars” and “I have had […] job offers from out of the blue without even an interview, from the world’s most desirable company” (White 2016: 72). In western magick, the Bornless Ritual has been used to protect Goetic magickians from harm. It has also been employed to invoke the “holy guardian angel”. But White appears to regard it as a suitable vehicle for wealth magick (73). There was much in the book I found inspiring, particularly the analysis of the world economic situation. But, despite admiring White’s genuinely devastating portrayal of how ‘the rules of this world were simply not built for your benefit’ (6), I deplore his proposed solution. And I have been puzzling ever since over the offence that this style of chaos magick provokes in me. 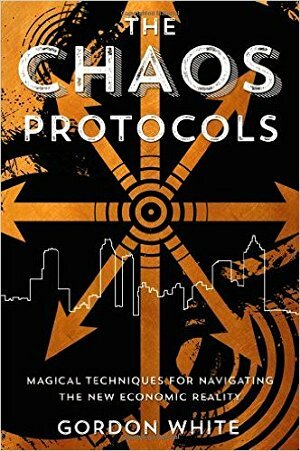 The Chaos Protocols, by Gordon White. Offence stems generally from holding beliefs too rigidly. So what justification have I, as a supposedly belief-shifting chaos magickian, admitting to an experience of offence? I hold the view that the importance we place on the results of our magick reveals something about our nature. Yet White regards as a “dangerous illusion” (54) the perspective that magick is a teleological or developmental process. His view is that we do not and cannot know what we really want (our ‘True Will’) because no such thing exists. Despite forgoing the notion of will, this seems a fundamentally Nietzschean moral outlook. It is indeed an enlivening critique of the sadly compliant muggle who assumes the good life is attained merely from obeying societal rules. However, “the life’s work of a chaos magician”, concludes White, is “fine-tuning probabilistic dials for fun and profit” (136), which (to anyone who has seen The Wolf of Wall Street) might sound more like a memoir of a stockbroker than a mage. White assumes a disparity of wealth between himself and his reader. “[Y]ou would not be reading this book because you would already be wealthy”, he jibes at one point, although he credits that I might “be reading it on the deck of your super-yacht in Croatia” (135). In the course of dispensing further careers advice, he proffers: “which option has even the tiniest chance of you owning a network of old folks homes and retiring to a private island?” (165), as if this were a self-evidently laudable aim. Is this really a book about chaos magick? Maybe it is, because White’s tone perhaps reminds us of the kind of political opinions that Peter Carroll frequently expresses on his blog. (Carroll must despair of the leftist, socially-conscious and wealth-indifferent folk who – in my experience – form the majority of those involved in the contemporary chaos current.) Yet, unlike Carroll, White seems a little uncomfortable with his own views. At one point he laments: “no one explains to you how difficult it is to demonstrate enough personal success to justify taking up the reader’s time without sounding like an appalling person in the process” (179). Maybe this was an insight that should have given him greater pause for thought because, evidently, like most, White wants to be a good person. To be seen as good implies that goodness is indeed something that others recognise and share. “[T]he fundamental form of human relationship”, writes Alasdair MacIntyre, following Aristotle, “is in terms of shared goods. The egoist is […] always someone who has made a fundamental mistake about where his own good lies and someone who has thus and to that extent excluded himself from human relationships” (MacIntyre 1985: 229). One of the most pernicious effects of globalised capitalism is its atomisation of society. Whatever the latest technology, convenience or working practice, it seems always at the expense of human relationships. White wants to dance his own dance, and yet it seems to be very much to capitalism’s tune. You picks your paradigm. You pays your price. 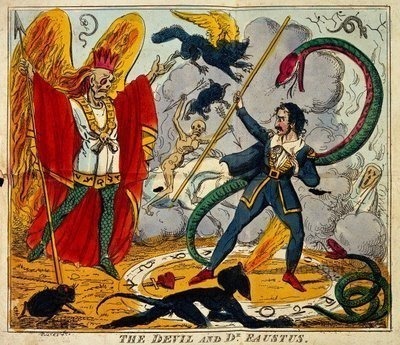 White’s fundamental egotistical mistake is perhaps due to the underlying magickal model he adopts in the book: the deal with the devil (or trickster). “You will get nowhere in magic or in life”, he suggests, “without a robust relationship with the Lord of the Crossroads” (106). Yet, ever since Doctor Faustus, it is clear that anyone who enters into such a deal loses their soul. As in goetic workings, where the magickian expects to be screwed if the spirits are given leeway, so the signatory of the midnight crossroads pact must recognise that their soul is necessarily forfeit. This is simply the consequence of entering into that magickal model. But I suspect that, in his rejection of the concept of “True Will”, White assumes he has no soul in the first place to lose. However, this exempts no one from the conditions of that magickal model. This is the error, I think, that accounts for the ethical vacuity of The Chaos Protocols, despite its perspicacity in so many other respects. Either White assumes that his soul is not worth saving, or by assuming he has none to lose he is attempting playing a trick on the trickster, and in the process identifying with that from which he hoped to extract a bargain. But in this way he simply swindles himself; he ends up doing the devil’s work, instead of the devil doing his. This was the source of my offence, I realised: the lack of importance placed on the development of the soul. If that really plays no part in chaos magick, then neither can I.
MacIntyre, Alasdair (1985). After Virtue: a Study in Moral Theory. Second edition. London: Duckworth. White, Gordon (2016). The Chaos Protocols: Magical Techniques for Navigating the New Economic Reality. Woodbury, MN: Llewellyn. So the long and short of it is that I’m higly skeptical of any deals to be made between myself and any such spirit as I could not neccessarily understand or infer the motives of. Though, as an initiatory exercise I have some interest in the headless rite (which as I understand it, is actually the original name for the ritual, having been changed colloquially to “bornless” only after Aliester Crowley referred to it as such, some hundreds or thousands of years after its original inception) but even that ritual, well known and apparently much loved as it is, still elicits in me the nagging tug of reticence and mistrust. I wonder, if you have found the time to read this long winded communique of mine, if you might write me back and offer a fledgeling magician a more seasoned perspective on the matter? A magickal practice that did not include evocation or invocation would in my view be one that lacked many of the most interesting, exciting and transformative aspects of magick. Have you considered developing a relationship with an entity that *by definition* has your best interests at heart? Examples include Ganesha from the Hindu pantheon, and your Holy Guardian Angel from the western mystical tradition. These will not harm you because their function is expressly to preserve you from harm. If your question is indeed as Bonhomme has interpreted it, then the Headless Rite will not harm your soul because its avowed purpose is to invoke an entity (your HGA) that has your best interests in mind. Also, consider what is meant by “soul”. Is it a “thing” that external parties can somehow augment or damage? Or by this term is not something more dynamic intended; something more like a process or an action rather than an object? For the neoplatonists, the soul is an image of the divine enshrined in the human individual, which perhaps suggests that it possesses an aspect of complete self-determination, at odds with the idea it is a “thing” or “object” upon which harm or benefit can be wreaked by things other than itself. If our soul is “tarnished” then is this not because we have engaged in “tarnished” activities, rather than an effect inflicted upon it by something outside? If so, then there is always the remedy of turning the soul towards “untarnishing” activities instead. Have a look at the other sermon on this site, “Spritual Practice Versus Mental Illness: a Divine Comedy”, which touches upon this idea, where it considers Heaven, Hell and Purgatory not as “places” but as different modalities of the activity of the soul. Useful stuff to think about, I hope! Dear Leito, I understood your question to be, “will I damage my soul by performing the headless/bornless ritual?” Is this a fair way of putting it?